In this section, I will give you a step-by-step tutorial on how to create your first site (virtual server) with Caudium. If you want to do something useful with Caudium, you have to create at least one virtual server. Without this first server, Caudium will not do anything. If you use your browser to access your server, you will only get a dialog box prompting for the CIF. login/password. A virtual server allows you to have several servers running on the same port. For example you can have www.foo.com and www.foo.org running on the same port and machine. This is why it is called virtual server. To create your first server, log into the web based CIF.. Click on the Virtual Servers tab, then the button. Type in an easily identifiable name. You also have to select the configuration type. 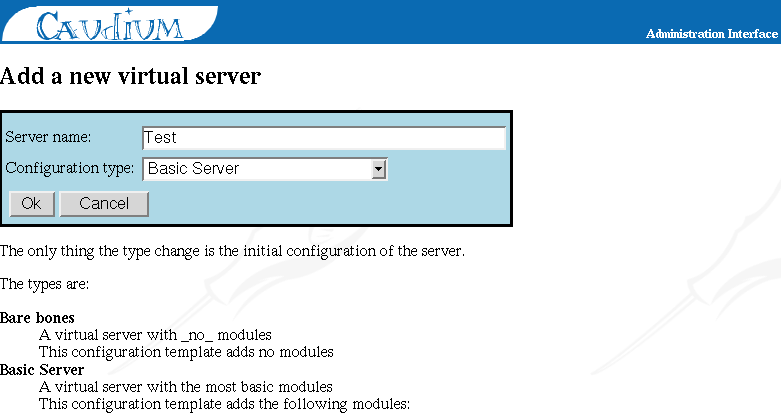 Depending on the configuration you choose, your server will have a different set of modules. In other words, your server will have different capabilities. For your first server, choose Basic server, and click OK.
Now you'll see the Virtual Servers page again. As you can see, you have two different folders to work on: Server variables (Figure 4-1) and File system (Figure 4-2). Server variables contain the URL of your site, and the port on which it will be available. 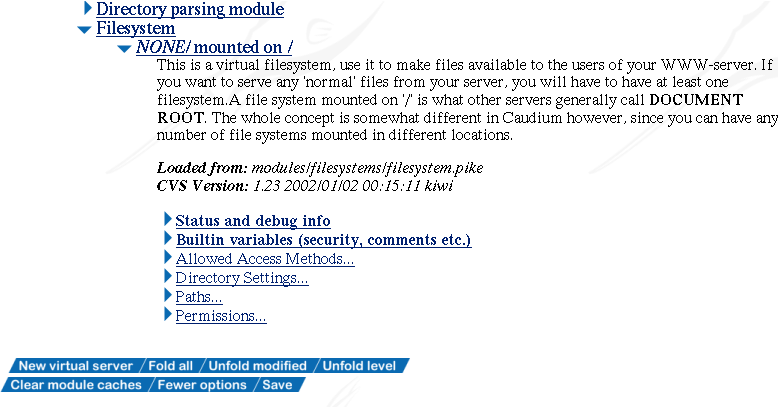 File system describes the files/directories containing the .html and other files you want Caudium to serve. In server variables, go into Listen ports and choose Configure a new port. Use the default values, choose Use these values, and click . Now select the URL of your site, and select Continue. You can now go back to the page displaying all of your modules, that is, where you were before you had gone into Server Variables. Under your server name, you'll see the status of your server. If it contains the word "Open" in blue everything is okay, and you can continue with configuring the file system. If it contains the words "Not open" in red, there is a problem. You can go into the Event Log via the CIF. tab to investigate. If you have an error Failed to open socket on 0:80 (already bound ? ), you may have another program or Caudium itself already running on this port. To fix the problem, identify the program which is using this port, and restart Caudium . To restart Caudium, go into Action->Shutdown->Shutdown Caudium->Restart Caudium. Wait a few seconds, and when prompted, select Virtual Servers. Now select your server, and you should have the word "Open" in blue. In the CIF. you may wonder what are those two different protocols http and http2? The difference is that http2 uses Caudium's internal memory cache while http is plain Pike http subsystem. So http2 is faster than http as you might expect. However, there are some issues on some specific sites. 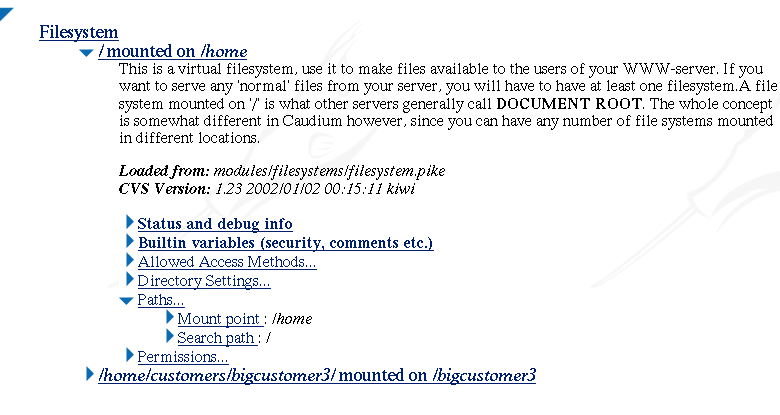 By selecting a file system, you tell Caudium which files it will send to people browsing your site. For those who know other web servers, please pay close attention to these explanations, because Caudium is quite different from other servers in this respect. Example 4-1. Your user filesystem. And suppose your URL is http://www.iteam.org/. With a default configuration, you would say that http://www.iteam.org points to /home/ so that you will have customer1 under http://www.iteam.org/customers/customer1, bertrand under http://www.iteam.org/friends/bertrand and bigcustomer3 under http://www.iteam.org/customers/bigcustomer3. But bigcustomer3 gives you a lot of money and he asks you for an URL such as http://www.iteam.org/bigcustomer3. However, he doesn't want to be moved from /home/customers/bigcustomer3 because of his FTP client's configuration. Moreover, you can't move the other accounts. With the mount point philosophy, you just have to create another mount point saying that /home/customers/bigcustomer3 is mounted on /bigcustomer3 so that when someone uses http://www.iteam.org/bigcustomer3, Caudium will serve them files from /home/customers/bigcustomer3. Now let's return to our setup. Go into the File System module, and select NONE/ mounted on / -> Path -> Search Path. Here you will decide which of your directories will be available when someone hits the root of your server. Write, for example, /home. You can now launch your favorite browser to the URL of your site and enjoy. Finally, to allow bigcustomer3 to get to his URL, go to File System -> Copy Module. Next, go to Path -> Search Path and type /home/customers/bigcustomer3, then type /bigcustomer3 in Mount point. The Figure 4-3 shows the output you should have. If you created these files/directories after you point Caudium to your site, it is safe to go in the Actions tab, then to Cache -> Cache status -> Flush caches. A web server is usually running on a single port and on a single IP address. So how can someone have different sites on this single port and single IP? The solution is to tell Caudium that the server is different based on the URL. This is the task of the Virtual Hosting module. As this module is not present in the Generic template we use, you will have to add it. Just use the Add module button, and click the image named "Virtual Host Matcher". Example 4-2. A simple virtual hosting regular expression. Example 4-3. A better and quicker regular expression. 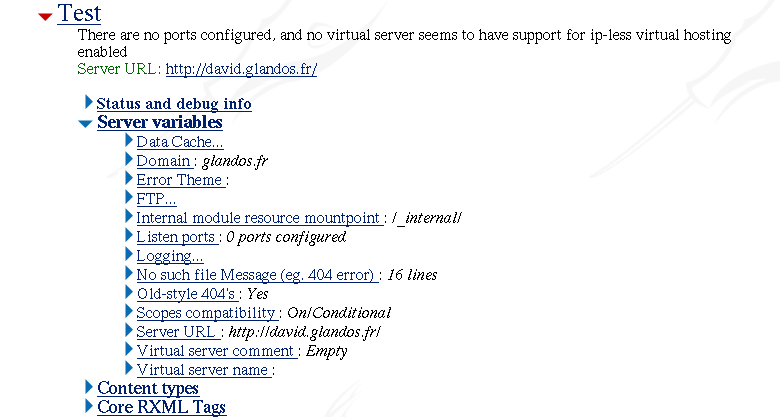 # echo "127.0.0.1   www.virtualhost.com" >> /etc/hosts. Change the file system root and /tmp in File system -> NONE/ mounted on / -> Paths -> Search path. You can now point your favorite browser to http://localhost/ and http://www.virtualhost.com/ and see the result. If you have an error telling you www.virtualhost.com is unknown check your host file. For more information about virtual hosting, see the Virtual-Web Mini-HOWTO available at the LDP or in /usr/share/doc/HOWTO or /usr/doc/HOWTO under Debian GNU/Linux.